Keeping a few domestic ducks in the garden is a growing trend and having kept them myself for a few years, I can understand why people are drawn to keeping a few of these webbed wonders. Nine out of ten people who start keeping ducks started with chickens first. I frequently get asked questions about keeping ducks from experienced chicken keepers, there seems to be a common belief that ducks are more difficult to keep than chickens and that you need a pond or small lake to be able to keep them which will soon turn into a mud bath. When I started keeping ducks, I also had many of these preconceptions most of which turned out to be wrong. There are four main types of duck: domestic, dabbling, diving and sea ducks. The first type; domestic ducks (or pet ducks as most people call them) are the main focus of this article. The last three types are called ‘Ornamental Wildfowl’ or simply ‘Wildfowl’ and they spend a large proportion of their time on water and require their wings pinioning when very young to stop them from flying off. They require a large pond or lake and suitable habitat for nesting and are unlikely to tame so it is best to start off with domestic ducks. A pond suitable for keeping ornamental wildfowl. There are many different kinds of pure breed domestic ducks – you can see the ducks that are standardised in the UK on our Duck Breeds pages. Domestic pure breeds are divided into categories of ‘heavy’ (such as the Aylesbury or Pekin), ‘light’ (such as the Abacot Ranger or Campbell), ‘runner’ (which is the many colours of Indian Runner ducks), Bantam (such as the Black East Indian) and ‘call’ (which covers the many colours of Call ducks). Most domestic ducks will provide you with a good number of eggs and if you have the patience, can become quite tame. Ducks need water, although not as much as you might imagine. 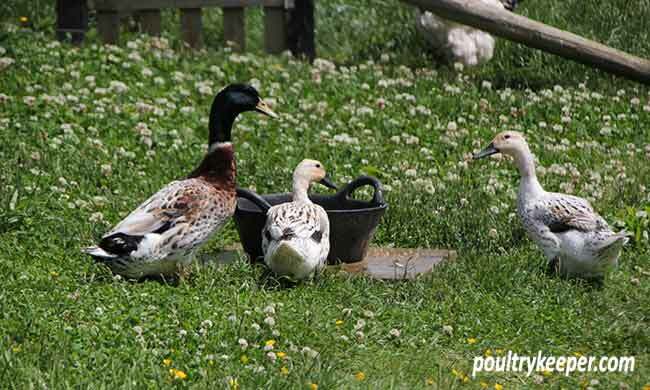 Domestic ducks only spend around 10% of their time on water, so a plastic water tub that can be tipped out and refilled is actually far better than a small fixed pond that will soon get full of mud, muck and feathers. Plastic tubs can often be found in Garden Centers or builders merchants and providing the water is deep enough for ducks to dip their heads (ducks have no tear ducts so rely on water to wet and clean their eyes) and there is enough room for them to climb into the water to bathe, then they should be fine. 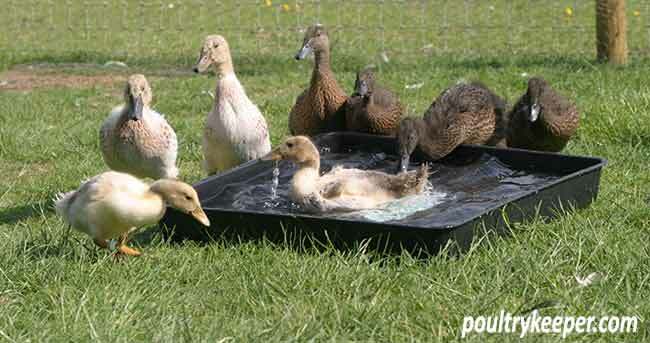 You will spot many children’s plastic sand pits turned into duck baths in back gardens! Remember young children can drown in as little as an inch of water so must not have unsupervised access to the duck’s bath. This tub is only shallow but suitable for these young duck to bathe in and drink from. It can be moved around and refilled daily to save the grass from turning to mud. If you are fortunate enough to have a large pond in your garden, you will need to consider security from predators at night. Although ducks will take to the water to escape predators such as the fox, domestic waterfowl often wander from the pond and will usually be lost unless suitable protection is provided for them. An electric fence is a good option around the outer perimeter of their area, or, they should be housed at night. If the pond is big enough and you can get ducks used to going to an island, they will be safe there. An island might be natural or could be a floating man-made island. Adult ducks can be fed on layers pellets and wheat. I keep dry pellets in a hopper for them but place wheat into a half sized bucket under water. This softens the wheat and aids digestion but also stops crows and other birds from coming and having a free meal and potentially bringing in disease. Pellets are kept in a hopper either with a rain hat outside where crows will not venture, or hung up inside their house, either way, they are kept dry. Drakes or ducks that aren’t laying will eat more wheat and less pellets but laying ducks need the extra calcium found in the pellets to produce eggs so make sure they can get to pellets as and when they need them. Layers mash isn’t suitable for ducks because mixed with water, gets stuck in their bills so is best avoided. Ducks need to be locked up at night, unless they are in a predator proof enclosure. They usually won’t put themselves to bed at night like chickens (ducks can see quite well at night and can be quite active) but if locked up regularly, they will often get into the routine of going to bed. Ducks are very easy to put to bed, if you hold out your hands and give them a cue (I say ‘bed ducks’) they will herd easily. You can steer them left or right by moving your hands or body and they can be guided to the door of their house. It’s often best to place this next to a fence or wall so that they are cornered, otherwise a few will end up going around the house and you’ll be chasing them for longer than needed. Duck houses don’t need perches although the doorway should be as wide as possible since ducks tend to do things together as a body and will trample on one another if they are going through a small opening. Just like chicken houses, ventilation is important. They can get spooked by lights at night so facing any openings away from the moon or lights is the best bet. With the exception of Call ducks (which can be noisy, “calling” is what they were bred for!) ducks are quieter than chickens so keeping a few ducks may well be the answer if you don’t want to disturb the neighbours. If you allow your birds to free range around the garden, chickens tend to scratch up everything they can find in search for worms and other delights. They will peck at most plants that are chicken height. Ducks on the other hand will not bother so much with plants and don’t scratch up the ground with their webbed feet. Young plants, especially vegetables are vulnerable to both chickens and ducks and should be protected. This is easier to do with ducks as a 30cm high fence will suffice to keep most ducks out. Ducks will of course still rid your gardens of slugs, snails and many insects with far less damage. If there is water and soil available together, you will find ducks soon find the magic formula for making copious amounts of mud! The best way I have found to deal with this is to keep ducks in a hard-standing enclosure or yard when it is very wet, and either move baths around regularly, or place them on hard-standing where they can’t spend hours dabbling between water and mud. If you are one of these nine out of ten people who keep chickens and are thinking of moving on to keeping ducks then the two words ‘Red Mite’ probably make you a shiver. Well, the good news is ducks don’t usually suffer from red mite infestation – their feathers are so thick and with the combination of oil on the feathers and them moving around at night, red mite just can’t get to feed off ducks. You can keep chickens and ducks together if they have enough space. Remember chickens can cause severe damage with their sharp beaks so you need to ensure there are enough feeders for ducks and chickens to be able to go about their business without interfering with one another. Space is the key to allowing them to live in harmony. The Domestic Duck by Chris and Mike Ashton. For further reading and as THE reference book to have on the shelf, I can highly recommend Chris and Mike Ashton’s book. This covers absolutely everything you’ll ever need to know about keeping ducks. I can highly recommend it for beginners or the more experienced keeper. I wouldn’t be without this book on my shelf as a reference and I am constantly dipping into it. Click here or on the image to view it on Amazon. Ducks will soon empty a water container and make it muddy. A tripod with 3 perches around the legs about 30 cm off the ground works well. Hang the water container in the middle above the height that ducks can reach but at a level that the chickens can reach once they are on the perches of the tripod. Feeding wheat in water as described above also works well, stopping chickens from eating the wheat but allowing the ducks to take it ad-lib. Ducks are wonderful characters and lots of fun to keep. I hope this information provides you with some of the basic ideas to get started keeping ducks.